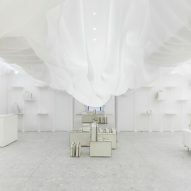 Clouds of folded fabric line the inside of this pop-up store, created by Snarkitecture during Milan design week to mark the 80th anniversary of Italian accessories brand Valextra. The New York-based design studio created a framework based on scaffolding systems, and stretched white material around it to form soft walls – leaving the underlying structure visible. Overhead the ceiling is covered in draped mesh, which creates a rippling effect that spreads down to the walls. 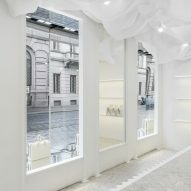 The store is divided into three main sections, each of which are lit by globe-shaped pendants, and feature contrasting shades of white, designed to create a "surreal ambience". 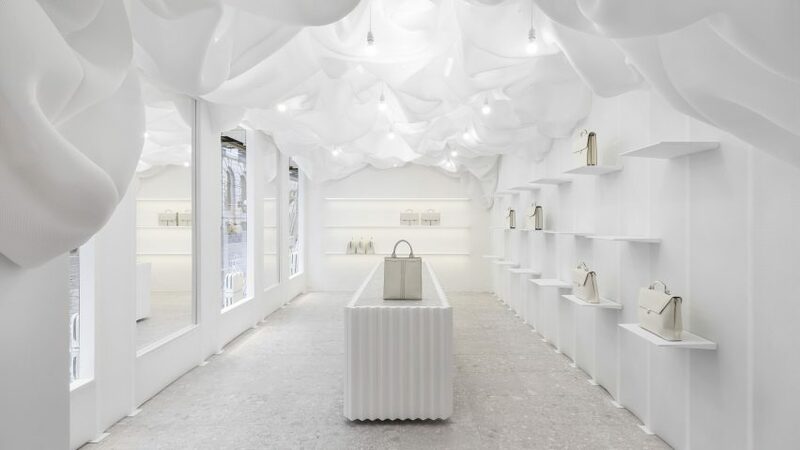 "[Our] use of white is about reduction and simplifying elements from our normal surroundings," said Snarkitecture, which was set up by Daniel Arsham and Alex Mustonen in 2008. The duo – who ranked at number 202 on the inaugural Dezeen Hot List – often create spatial installations. In the past they have suspended 700 Air Jordan replicas in a Brookyln menswear store, and filled a Washington DC museum with almost a million plastic balls. "By inviting visitors into a monochromatic environment, we hope to create a space that feels transformative – an experience that transports you from the familiar and everyday," they added. 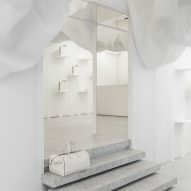 The shop's interiors also feature a replica stone floor made from fibreglass – inspired by several visits to Milan by the designers – and quilted fabric and fur, which cover the end walls. "We were interested in the juxtaposition of hard, architectural surfaces with soft textures, as well as the play between precision (the grid-like scaffold) and looseness (the irregular scrim fabric)," added Snarkitecture. 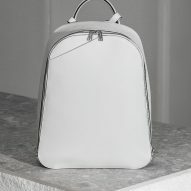 The pop up showcases Valextra's all-white MonochroMe collection, launched to celebrate its 80th anniversary. 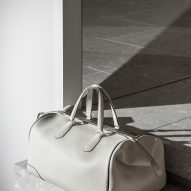 It features updated pieces from its archive, including purses and wallets that date back to the 50s, and luggage from the 60s. 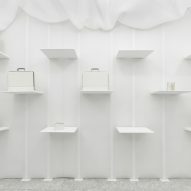 The pop-up was located at the brand's Via Manzoni store for the duration of Milan design week, which concludes today. Elsewhere in the city, Japanese designer Tokujin Yoshioka has designed glowing walls and chairs that gently pulsate for LG, and Nendo has created a similarly all-white sanctuary to host its exhibition of jellyfish vases and tables that melt into bowls.